This airticle is aboot the comics creator. For ither uisses, see Stan Lee (disambiguation). 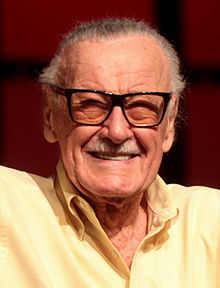 Stan Lee (born Stanley Martin Lieber, 28 Dizember 1922 – 12 November 2018) wis an American comic beuk writer, editor, publisher, media producer, televeesion host, actor, an umwhile preses an chairman o Marvel Comics. In collaboration wi several airtists, includin Jack Kirby an Steve Ditko, he co-creatit Spider-Man, the Hulk, the Fantastic Four, Iron Man, Thor, the X-Men, an mony ither fictional chairacters, introducin complex, naituralistic chairacters an a thoroly shared universe intae superhero comic beuks. In addeetion, he heidit the first major successfu challenge tae the industry's censorship organisation, the Comics Code Authority, an forcit it tae reform its policies. Lee subsequently led the expansion o Marvel Comics frae a smaw diveesion o a publishing hoose tae a lairge multimedia corporation. He wis inductit intae the comic beuk industry's Will Eisner Award Hall of Fame in 1994 an the Jack Kirby Hall of Fame in 1995. Lee receivit a National Medal of Arts in 2008. Wikimedia Commons haes media relatit tae Stan Lee. This page wis last eeditit on 12 November 2018, at 21:07.